* What’s something that surprises keto newcomers? There is frequent urination in the first few days of following a ketogenic diet, the increased urination is due to the depletion of glycogen in the muscles. Glycogen stores water, this is why most people lose a tremendous amount of weight initially starting a ketogenic diet because it is water weight. You may also be constipated due to the water loss. Make sure you drink a lot of water and consume high fiber vegetables to offset the loss of water that naturally correlates with the ketogenic diet. Drink one half your body weight in ounces of water per day. It is best to drink pure natural alkaline hydroxide water (AQUA OH). This water helps eliminate inflammation, ultra hydrates and cleans out the detoxification pathways. Avocados have approximately 12 grams of fiber and they are a great food for a ketogenic diet, I recommend eating at least one of them daily. * What are some common mistakes on the keto diet? People do not eat enough fiber, and they still consume processed foods. Keto works best with high quality foods and low carbohydrate fibrous vegetables like dark leafy greens, cabbage, etc. Avoid processed foods like going through the drive through and taking the bun off a cheeseburger, instead make your own bun less burgers at your house with a higher quality beef. * Any surprising side effects of keto (i.e. changes in breath, menstrual cycle, etc?) Ketogenic diet can change your breath due the presence of ketones, make sure to consume at least half of your body weight in ounces of plain hydroxide alkaline water daily for best results. * Are you pro or con keto and why? Yes, I think the ketogenic diet is a great program for people trying to train their metabolism to utilize its own fat stores for fuel, control blood sugar levels while aggressively losing weight. 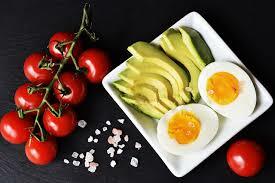 The ketogenic diet should not be the end all be all, I am a promoter of diet flexibility. Just like our workouts, we need to mix up our nutrition to keep getting a good response from our metabolism. A example of this would be to follow the ketogenic diet for 2-4 weeks, then try intermittent fasting, then a more plant based diet, etc. Our body likes to adapt and when it gets used to a certain program it will not respond as it once did, this is why it is important to switch things up often.